Tonight in a battle of Top Rank sluggers on HBO, light welterweight Mike Alvarado (33-1, 23 KO’s) and Brandon Rios (31-0-1, 23 KO’s) will be fighting in a rematch at the Mandalay Bay Resort & Casino, in Las Vegas, Nevada, USA. The fight has a lot riding on it for the 26-year-old Rios because his promoter Bob Arum wants to put him in bigger fights next against Manny Pacquiao, Juan Manuel Marquez or Tim Bradley. There’s less of an upside for the 32-year-old Alvarado because Arum hasn’t been vocal about wanting to put Alvarado in with Pacquiao, Marquez or Bradley if he beats Rios. It’s likely he’ll put Alvarado back in with Rios in a third fight immediately to give his highly hyped Rios a chance to redeem himself so that Arum can move him in against his better known Top Rank stable fighters. It’s widely believed that if Alvarado makes the decision to slug with Rios like last time in October last year, Alvarado will be lucky if he makes it to the midpoint of the fight. 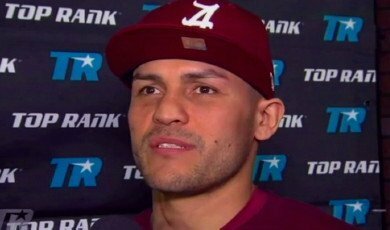 Indeed, Rios is predicting that he’ll get Alvarado out by the 5th round, and he doesn’t believe that he’s capable of fighting a disciplined fight where he boxes for 12 rounds. Given that Alvarado has been fighting with the same style his entire 9-year pro career without his trainers pulling him aside to fix his glaring defects in his game it’s not likely they will have done anything to fix it for this fight. That’s on Alvarado and Top Rank for not finding trainers that can fix his flaws because the move should have been done ages ago when it was clear that Alvarado gets hit way too much for a guy as tall and as big as he is.